Perhaps the Best Wings Ever? – Damn Life is Good! Perhaps the Best Wings Ever? Man, do we love chicken wings! Spicy, meaty and pretty much the perfect food accompaniment to a great football game or an awesome action movie. We’re tried every approach: frying, baking, grilling, steaming (yup, that turned out how you think it would – yuck! ), and have modified and tweaked our approach for years.These are grilled. This is a tough recipe to beat (but easy to eat!) – and it’s fun to make. We first make up a fresh batch of ranch dressing and slice and dice the celery into 3-4 inch pieces (we put them in a coffee cup with a bit of water in the fridge to keep them crisp). Chop the oregano, rosemary and garlic and put in in a large Ziploc freezer bag. Sprinkle in a bit of salt and pepper and drizzle in the olive oil and mix it up a bit. Slice up your wings into the drumettes and the other bits (what are they called? You know, the piece with two bones…). Toss those into the freezer bag with the herbs and oil, seal it up and masage the wings to get the herbs and oil all over the skin. You’ll want to do this 15-20 minutes before you flare up the grill. For the wing sauce, we keep it flavorful but simple (and spicy, but not overly hot). Since we’re grilling, I use a small Calphalon saucepan that I’ll put right on the warming rack of the grill. Chop the butter into roughly 1T pieces and put in pan and add the Franks. I use our pepper mill and put in a TON of pepper – 50 twists on the mill. Then add cayenne to your tastes (we do about 1T for this size batch). 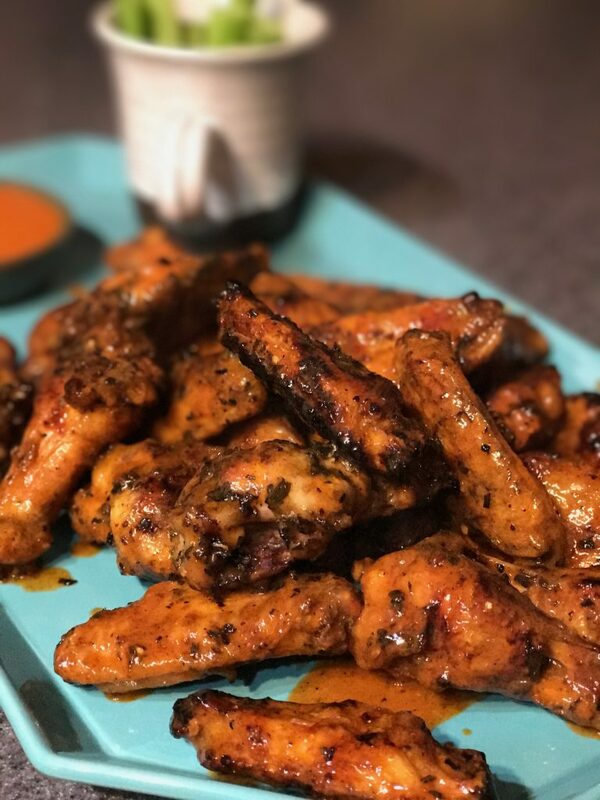 Get your grill heated up to medium (350-400 degrees), put your not-yet-melted sauce on the warming rack or off to the side and dump out your wings. Arrange on the grill so they aren’t too crowded. You don’t want your grill too hot, otherwise the olive oil will flare. Flip regularly and swap out the ones on the hot spots with ones that aren’t cooking as fast. It’ll take 20-30 minutes of grilling, maybe four to five flips – you want them charred in places, but not burnt, with the skin sizzling and bubbling. Meanwhile, whisk your sauce and mix it up. When the wings are done, I pull them out into a large stainless bowl, pour in the sauce (after I reserve a little in a dipping bowl) and mix them up. Serve with the celery and ranch and a TON of napkins. You’ll be happy – very happy! Pro tip: this may seem sacrilegious, but if you want to zig when others think you’re gonna zag, do the recipe above, but with chicken legs!